Plzensky Prazdroj is a beer name that not many beer drinkers may recognize, but call it by its better known German name Pilsner Urquell and all of a sudden you’re feeling thirsty. Pilsner beer is one of the products that the Czech Republic is famous for and if you’re a great fan of Czech beer, as my other half is, a visit to Pilsen or Plzen could be a thirst-quenching experience – Pilsen is home of the Pilsner Urquell Brewery. Although pilsner beer has been brewed in the town of Pilsen since it was founded in 1295, the Pilsner that is known around the world today is associated with the brand name of Pilsner Urquell. But whether you use the name Urquell (German) or Prazdroj (Czech), both these words have the same meaning – “original source”. Pilsner is the original and first pale lager beer in the world. 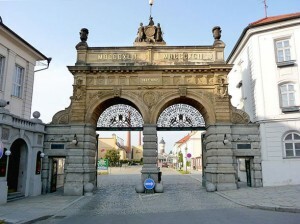 Since 1842, the Prazdroj Brewery has been brewing the golden Pilsner Urquell. But before this time, the general brew was a dark top-fermented beer which was of a poor quality. According to a legend, the Burghers of Pilsen gathered in the town square in 1838 and poured 36 barrels of beer into the drains as they had had enough of the poor quality of brews that were being passed as beer. They got together and built a new brewery and a young Bavarian brewer by the name of Josef Groll was given the task of producing a better quality beer. Groll produced a crisp golden brew that was bottom-fermented. Its colour and taste amazed the town folk and hence the Pilsen lager was born. According to another legend, when Emperor Franz Josef I, King of Bohemia, heard rumours of the new beer he travelled to Pilsen in search of it. After tasting Groll’s new brew, the Emperor swore never to drink any other beer except for the pure Pilsner from Pilsen, what an endorsement! I now begin to understand why my husband likes his Pilsner Urquell. This new golden lager was fit for an Emperor. It seems that many of the pale lagers produced in the world today are based on the original Pilsen beer formula. Brewers the world over have tried in vain to imitate the unique taste of Pilsner Urquell and if you visit the brewery you can learn about the noble hop, the soft water and other secrets behind the making of this legendary lager! There is a day tour from Prague that takes you to the Pilsner Urquell Brewery. On this factory visit you will learn about how the old dark pilsner was brewed and drunk in the past, in contrast to how it is brewed and drunk today. Of course no visit to the Pilsner Urquell Brewery is complete without a visit to its historic cellars to taste some of the pure Pilsner beer. And included in this tour is the cost of your lunch in the brewery’s restaurant Na Spilce. I should also mention that the Gambrinus Brewery is here as well – another nice Czech beer. This day trip from Prague also includes a visit of the Nizbor Bohemia glass factory. Bohemian glassware is another of the Czech Republic’s popular products so in effect you will get to see two of Prague’s most famous exports on this tour. The post Pilsner Urquell – The Golden Beer Fit for an Emperor appeared first on Czech Republic Travel.